Holloway Eye Care & Optique is a full service Contact Lens practice. We provide fittings for routine vision, astigmatism, mono-vision, multi-focal, rigid gas-permeable, and more. We have Acuvue products, Bausch & Lomb, Proclear, Preference, and many more of today’s best brands available for you. You will be fit with the best contact lenses to suit your needs. For first time wearers we offer an Insertion and Removal instruction session from one of our Contact Lens Specialists. Our mission is to ensure that you are confident and comfortable with your new contact lenses. 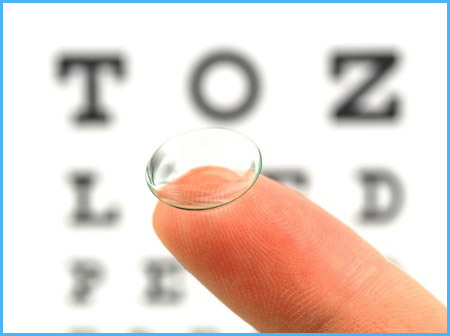 Contact lens fittings are a separate procedure from your routine eye exam. The doctor can do a fitting during a routine eye exam, but must be made aware of your desire for contact lenses either before the exam, or while you are in the exam lane. Since the fitting is a separate procedure a separate fee is applied. Some insurance companies do not cover contact lens fittings. If you are unsure of your coverage please check with your insurance company or our front desk before you decide to go through with your fitting. After the initial fit, you may be asked to return for a follow-up visit (at no extra charge) or to report your results over the phone to us. Your prescription will not be finalized until this has been completed. Thank you for your generous donation for our 20th anniversary celebration. We appreciate your community support and kindness. Thank you so much for your kind attention during my trip to Indiana… for talking to me at a late hour and for comforting me during a very scary situation… for promptly faxing my records… You all provided me reassurance and peace of mind. Your kindness overwhelms me so much that I cried on my way home after leaving your office on Thursday. Thank you so much for getting the upgrade on my lenses. They are so much better! If it weren’t for great people like you, there wouldn’t be grateful people like me. Thank you for your kindness and your patience. See you next time. Thank you for all your help it really means a lot! I was very pleased with my eye exam, as it was very professional and comprehensive. The doctor went over my family history, she explained every portion of the examination, and what she would be looking for during the procedure. My hat is off to Dr. Holloway along with the other staff. Thank you for taking such good care of Jack and referring us to Dr. Milner. We both appreciate all you have done. I wanted to take the time to thank you for the wonderful visit yesterday. You have such a wonderful way with our students and you make the evaluation so much less stressful than what the parents and child anticipate. These little guys have much fear and anxiety about the “drops” and the “lights”… the parents are equally anxious about having their child be upset. You made our visit such a delight! Dr. Holloway, I wish I had an award to give you, because I want you to know how much I admire you, your skills, and your warm way of dealing with my students. Thanks so much! Thank you for your exceptional service and kindnesses. You have helped me so much this year! You are THE BEST! Sign up for exclusive, advance Trunk Show invitations, new product announcements and appointment reminders!